Tiruvannmalai is considered one of the great pilgrimage for receiving Advaita Gyana from ancient times . So Gyana Pilgrimage with Guru Poornima Retreat in July 2016, of 48 days and 500 hours, is going to take us into the essence of Gyana Yoga – the Adviata Philosophy . This is also an Teachers Training for Yoga Teachers, who wanted to focus on ultimate experience of liberation, by Surya Yoga . Here we explore the spiritual side of Surya Yoga, which not only heals our bodies from disease, and help us to receive wellness , happiness and well-being, but goes much beyond, to experience complete liberation from our tendencies of mind which creates disease , pain and distress. The retreat will start with the pilgrimage to the holy sites of Tiruvanamalai, alongwith sacred walks around Arunachala explaining the deeper significance of these temples and how there architecture help us to gain higher yogic and spiritual experience. A special session will be conducted on Dakshinamurty ( Adi Guru/Adi Yogi)Temple where the science of Surya Yoga was revealed to Sri Joydip in Tiruvannamalai . We will start the retreat from 2nd July ‘2016 and the schedule will have daily Surya Yoga session , Daily sacred walks around Arunachala , Session on Yoga philosophy and the discussion on Kaivalya Pada of Yoga Sutras. Sri Joydip started teaching yoga in 2003 as a part time teacher sharing his own practices to a group of people. In 2007, he joined a professional course in the psychology of yoga at Sri Aurobindo Center. The course emphasized on the psychological aspect of yoga. Sri Joydip also joined the trainings on first and second degree Reiki from Reiki Kendra, where he learned about the subtle aspects of healing and therapy. In 2009, Sri Joydip had a deep spiritual experience in Sri Aurobindo Ashram, followed by the encounter with his guru, Arunachala Shiva and Dakshinamurty in Tiruvannamalai. In 2012, Sri Joydip went into a deeper search and sadhana on yoga for one year. That year, Sri Joydip went on meditation with Sri Dakshinamurty in a temple in Tiruvannmalai. He found a system of yoga that revealed to him how we can connect with the energy of the inner sun with a group of mantras, pranayamas, Surya kriya and asanas. Surya yoga alongside Surya kriya and Surya Dhyana formed parts of a yoga system which is referred as wellness yoga. It helps build mindfulness and awareness that could heal disease and create a sense of wellbeing and make people happy. 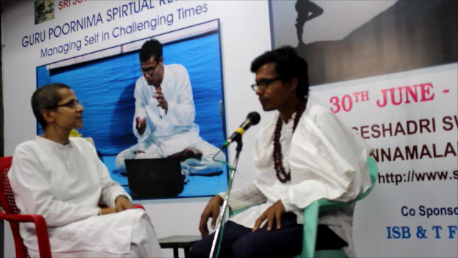 In 2013, Sri Joydip joined a yoga teachers training workshop with Ramkrishna Mission Vivekandanda University. As a yoga filmmaker, Sri Joydip has created two films on the subject of yoga as medicine and yoga for wellness. His film, Yoga as medicine, was highly praised and selected for screening in the 2013 edition of the Kolkata International Film Festival. In 2014 and 2015, Sri Joydip was elected secretary of the organizing committee of the World Yoga Festival 2014 in Burdwan and World Yoga Festival 2015 in Tiruvannmalai, where many different yoga schools participated and exchanged their thoughts and views on yoga. In 2015, Sri Joydip did 2 online courses at 2 international universities in Australia (Monash University) and Russia (University of Aberdeen) on mindfulness, peak performance, food and nutrition, and wellbeing. These courses helped him connect his knowledge about yoga with mindfulness, nutrition and food habits. This also encouraged him to create programs such as a wellness program and workplace wellness program which help many students to live well, become happy and have a general sense of wellbeing.